Fujitsu will presenting a new chip at this week's Hot Chips conference in Cupertino, California. 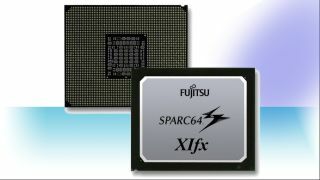 The SPARC64 XIfx will be the company's answer to the growing armada of US-based companies that have taken over what is one of Fujitsu's favourite playgrounds, high performance computing (HPC). Of the world's 10 fastest super computers, only one currently runs on Fujitsu's SPARC CPU with four powered by IBM's Power architecture, one by AMD and Nvidia and four others (including the fastest of them all - the Tianhe-2) running Intel CPU and GPGPU. Fujitsu's new processor is expected to deliver one TFLOPS which is what Intel's ASCI Red reached back in 1996 although the XIfx is expected to be deployed singly but in batches of more than 100,000 chips, to help break the 100 petaflops barrier, 3x faster than the current crown holder. New technologies like Micron's Hybrid Memory Cube - which stacks system memory in a 3D structure to deliver faster throughput and much better power utilisation - as well as Fujitsu's own new interconnect called Tofu 2 - which will be integrated on the processor - will be used to achieve that.